College freshmen in America these days are laden with more than hefty textbooks and course catalogs—for the cost of a degree continues to rise, according to a pair of College Board reports released yesterday. The reports, on college pricing (pdf) and student aid (pdf), find that the average published tuition and fees prices for the 2017-18 academic year are up once more—at modest rates of under 2% this time around, but still outpacing inflation—while financial aid is not. The average annual cost of a private, nonprofit, four-year education is now $34,740; it’s $9,970 for public four-year institutions and $3,570 for public two-year colleges. Net prices for full-time students have now increased for six to eight straight years, depending on the sector. Such jumps are moderate compared to those made in the years right after the recession: In 2009-10, private and public schools hiked their tuition and fees by 6% and 10%, respectively, for example. 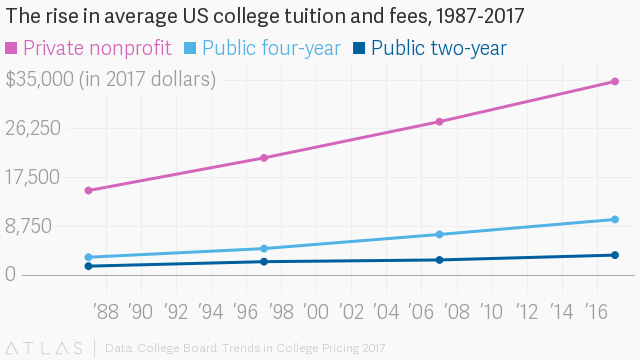 But the continuous increase in college sticker price adds pressure to the crisis that’s been plaguing higher education for decades: with diplomas so necessary for work in the modern world, how can schools—expensive, laborious operations, full of high-paid faculty members and costly research projects—stay affordable and accessible? Research finds that the cost of a degree currently isn’t earned back until age 34. Individual schools all over the country are experimenting with ways to offer a cheaper degree, such as incorporating online learning or cutting overhead and amenities. The hope is that one day, solutions can be implemented on a mass scale. Until then, high-school students and parents who tossed aside those financial aid forms the first time around may want to take a second look—or consider, more broadly, what else is out there.